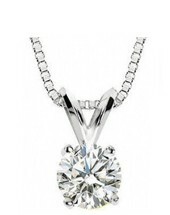 A simple, classic diamond solitaire pendant is a timeless, tasteful expression of style. 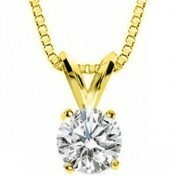 At BestDiamondPrice, each and every diamond for our pendant program is HAND SELECTED . They are chosen for brilliance, overall beauty and value. We sorts through hundreds of loose diamonds to select the very few that make it into our pendants. Once selected, they are hand set by our skilled craftsmen into 14kt yellow or white gold. A classic 18 inch, 14kt chain is added to the piece and then they are ready to wear. They are available in a number of different sizes to fit any budget. And as with many of our diamond items, they can be traded UP at a later time for the same price you paid (less a small deduction for wear and tear). So, if your budget doesn’t allow for the larger sizes at this time, you can select a smaller one, give it as a gift, and for a future occasion, trade it up towards a larger size. 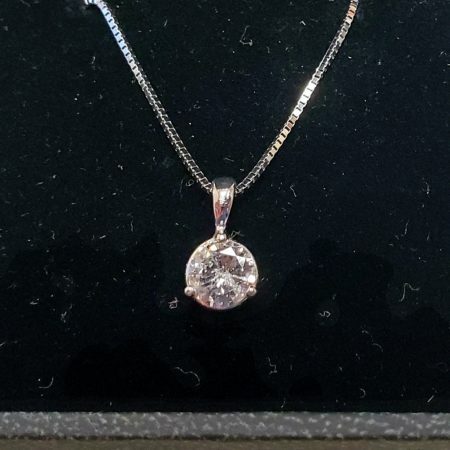 This way, she gets to wear the pendant now, and you’re set knowing you won’t lose any of your investment when you go to get her a larger one. Our professional diamond brokers are always just a phone call away and can tell you about the variety of diamond pendant options we offer. Please call a showroom* near you today. Appraised value on Value priced engagement rings is our best estimate of the national average retail of similar quality diamond rings. $3,200.00 $1,675.00 Does not include tax Sale! $225.00 $99.00 Does not include tax Sale! $425.00 $229.00 Does not include tax Sale! $500.00 $249.00 Does not include tax Sale! $695.00 $299.00 Does not include tax Sale! $800.00 $429.00 Does not include tax Sale! $2,900.00 $1,599.00 Does not include tax Sale! $6,200.00 $3,188.00 Does not include tax Sale!